an autograph session at London’s ComicCon. scuffle. What were they really arguing about? at the Slidell Memorial Hospital (Louisiana). can press her orders on a touch-screen. Howard County Fairgrounds in West Friendship, Maryland. continue to be too few in these commercials. for each baseball word. Not that so in South Korea. The Evening Standard is a popular newspaper in London. professional photographer for a British magazine. police chasing a group of thieves on their motorcycles. He grabbed his camera and quickly took a great picture. cousins that are deaf, and they use sign language. out of respect, scolded Foxx for mocking ASL? Or was Fallon unaware of Lieb’s two deaf cousins? allowed Foxx’s mocking of ASL to continue? Foxx is #1 on Matlin’s and Nyle’s hate list. 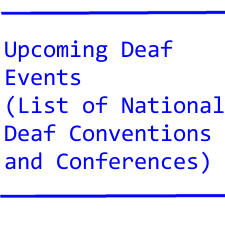 these past deaf recreational stories! sometimes the third word! Why not learn ASL? Why not use captions? Why not use an interpreter?